In cinema, there is a common type of architectural scene: a building is shown briefly from outside, with one or more persons approaching its entrance. After they disappear through the doorway, there is a cut to the building’s interior with the same protagonists we just saw now walking towards us. The seeming fluidity of the action suggests that the two scenes – interior and exterior – correspond to one and the same building. In reality, it is possible that they were shot in two very different locations, as interior scenes are often filmed in the more controllable environment of a film studio. Good cinematography, art direction and editing are capable of ‘blending’ two disparate locations into one, and in the same way that a magician always creates a distraction, the audience is usually too wrapped up in the plot to notice a filmmaker’s sleight of hand. In any case, when two very different locations are blended, one of them – the more manipulable interior studio set – is always made to appear as a plausible counterpart to the exterior location. The suspension of disbelief on the part of the viewer can, after all, only be taken so far. What do we make then of a real building in which the interior space has seemingly little to do with its exterior expression? There are certainly countless examples: John Soane’s house in Lincoln’s Inn Fields, London, comes to mind, as does Salvador Dalí’s house (actually three fishers’ houses he combined into one) on the Catalan coast near Cadaqués. Some hotels also offer up ‘surprises’ inside, such as the Burj Al Arab in Dubai, whose rather traditional interior bears no resemblance to the hypermodern and hyper-publicized exterior. Although more common than we might suspect, these kinds of inside-outside discrepancies are nevertheless usually limited to private or semi-private buildings such as residences, clubs, hotels, office buildings or private museums; buildings in which privacy and intimacy come before transparency. What makes the Llotja de Lleida surprising is that in this case, a highly public building has been designed with an exterior and an interior that hardly seem to belong to the same structure. Lleida is a small town situated on an agricultural plain in the Catalan interior to which Spain’s AVE high-speed train arrived some years ago, bringing with it demand for high-quality arts, culture and business facilities. The historical centre of this city, skirting a hill capped by a cathedral, is an important landmark at the centre of this vast fruit-growing plain. The new theatre and conference centre is situated on the other side of the train tracks from this hill, on a generous riverfront terrace formerly the site of a farmer’s market. The building’s characteristic inverted hourglass profile provides a large portion of the terrace with protection from winter rains (‘The rain in Spain stays mainly in the plain’) as well as summer sun, while acting as a new modern landmark in complementarity with the historical one. The main entrance to the building is from a plaza framed on the opposite side by a sloped structure with raked seating to effectively form an amphitheater. Upon entering the building beneath its dramatic overhang, a tall atrium appears inside which contains a generous staircase that similarly provides seating for impromptu performances. The stairs lead to a larger upper level that contains a vast foyer for the 1,000-seat theatre, a multifunction space, a smaller auditorium and conference centre, as well as offices. Finally, the top level is a public roof garden from which various trapezoidal forms emerge containing the theatre fly and other mechanical facilities. Structurally, the Llotja’s atrium and theatre form a concrete core to which the cantilevers containing foyer, conference centre, and other spaces are attached by means of large steel truss brackets. But only the drawn building sections reveal this constructional efficiency, as the structural system that supports the pronounced cantilevers on all sides is largely concealed from view. The interior spaces of the Llotja are not organized in line with the overall biaxial symmetry of the building’s outer form, but rather more like the dovetailed pieces that make up a Japanese puzzle box. These pieces are shaped and orientated in response to the surrounding context. The generous foyer of the main theatre, for example, from its elevated position over the building entrance, is orientated to overlook the old town across the railway tracks. Similarly, other spaces, such as the conference centre lobby, enjoy views over the river. The angular, trapezoidal forms that so strongly characterize the exterior are almost absent indoors; the interior comprising a much more diverse and less monolithic architecture than the exterior. In fact, there is so little resemblance between the Llotja’s exterior and interior, it would seem that the former is the location of an action thriller while the latter is that of a romantic comedy. According to the scriptures of modernism, the interior and the exterior of a building must be ‘honest’ with one another; only then does architecture have ‘integrity’. Mecanoo is of course part of the ‘Modernism without Dogma’ generation of Dutch architects (named after the 1991 Dutch entry in the 5th Venice Architecture Biennale, curated by Hans Ibelings); a generation that taps modernist heritage for inspiration but not for moral guidance. Indeed, the Llotja’s outer form is evidently inspired by the Aula Magna of Delft University of Technology, by Van den Broek and Bakema. But then its interior is clearly not, which is precisely what absolves the Llotja from some recent and rather absurd accusations of plagiarism. The Llotja’s interior is perhaps as accommodating as it is precisely because it was not subjugated to the relentless rigor of an über-prevailing singular architectural concept. Similarly, the exterior has a strong and coherent character precisely because it is not expressing the programmatic complexity of the interior; a situation akin to what Rem Koolhaas terms the ‘lobotomy’ of the Manhattan skyscraper in his seminal book Delirious New York. It is in fact remarkable how well the interior and exterior of the Llotja each do their job while seemingly oblivious to the other. But the question still begs to be asked: Why, then, this particular exterior, and this particular interior form? 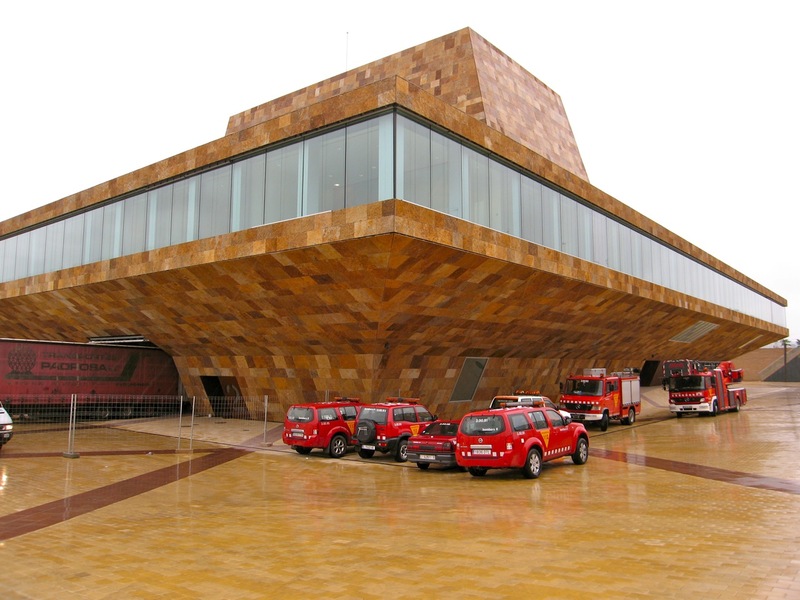 It is probably safe to say that, with the rise of the Bilbao Effect, interior space has taken on a secondary role to the much more media-friendly exterior image of buildings. (Is there even such a thing as an iconic interior?) In the general media architecture tends to be represented through frontal or three-quarter ‘full Monty’ photographs of building exteriors. The more stand-alone the building, the better. This overall primacy of the exterior image in architectural representation is unfortunate, not only because it turns architecture into a branch of set design, which it is not, but because it precludes considerations of why and for whom architecture exists in the first place. When the interior of a building doesn’t matter, neither do the people who live or work in it; and when the exterior image becomes everything, then architecture might as well exist solely for the aggrandizement of patrons, architects and politicians. And that starts to sound just a little too much like certain 1930s’ propaganda films. Catalan is a really interesting place, i'd recommend anyone interested in architecture and town planning to visit.